Ross Phillips is a wedding musician based in Austin, Texas. 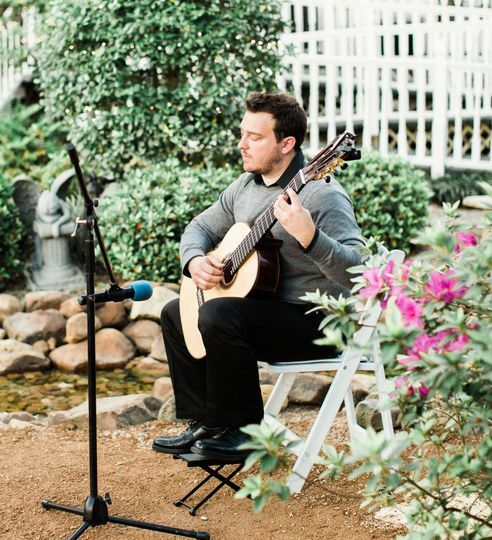 Ross Phillips is a professional classical guitarist who specializes in providing clients with ceremony and reception music that is tailored to their exact musical desires. He loves to give couples the opportunity to hand-select their wedding music, and to customize the soundtrack of their special day. With years of classical guitar experience, professional and prompt communication, and customized music selection, Ross Phillips will bring a sense of elegance and beauty to your wedding day. Ross Phillips has been performing professionally for nearly 20 years. With a bachelor’s degree in Music from Texas A&M, and an extensive touring background in versatile guitar performance, Ross is also a guitar teacher and the founder and CEO of an online music education platform. He has dedicated over five years of his career to the study of classical guitar, and performs at weddings in his hometown of Austin. Ross is a fantastic classical guitarist. He was punctual and very professional, and he worked with us on picking out the repertoire for the wedding (My husband and I are both musicians, so we have performed at many weddings. We were looking for less traditional music for ours). Everything he played was exceptionally prepared and he was a joy to work with. It really makes a difference to have someone of this skill level perform for your wedding. There are plenty of people who can get by and fumble through a song with some chords, but this man is a nuanced professional. We can't recommend him enough. Ross was so great and professional. We never had to worry from the day we first contacted him to the day of the event he was on top of things. He gave us many options of songs and even allowed us to give him songs to learn. I'm writing as a guitarist myself and dealing with other musicians in the past he is by far one the best. He showed up early and didn't require anything from us on the day of our wedding. Ross is great! He is flexible and very talented! It was a pleasure having Ross play for my wedding ceremony!